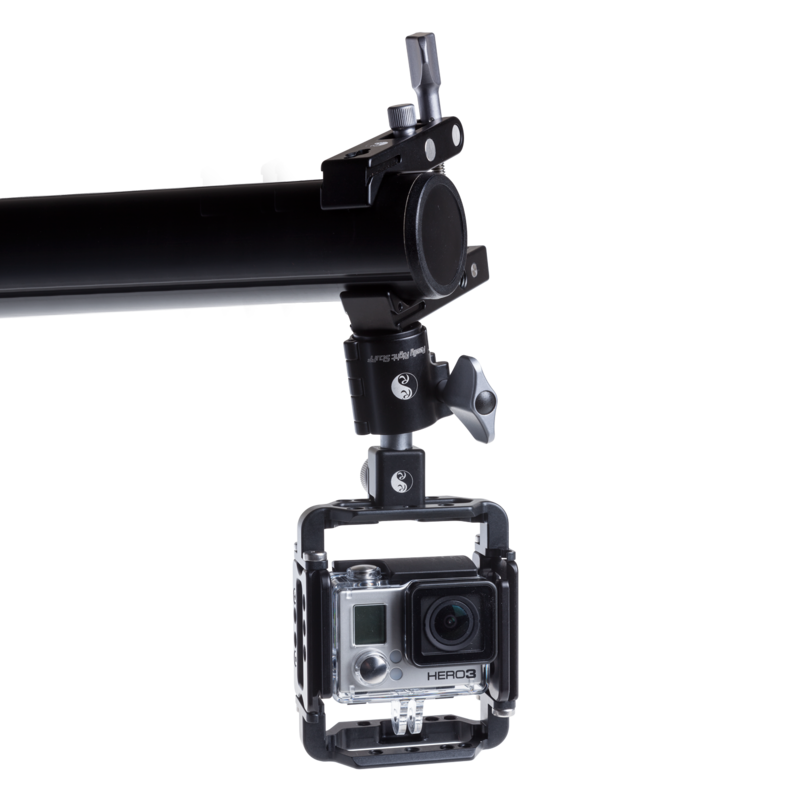 With the exciting release of the GoPro HERO3+ Camera, we felt it was time that we provide the perfect all-around mounting solution for one of the world’s most-used camera systems. 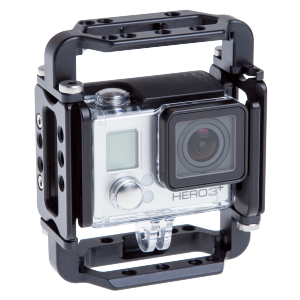 The HERO3+ with the RRS Cage Door and Full Cage components. 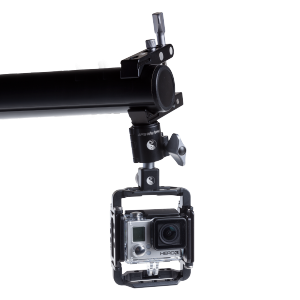 Introducing the RRS GoPro Cage System! The modular cage system was designed to allow the user to build up mounting positions as needed, minimizing weight and bulk. The RRS Cage Door replaces the housing door and provides a mounting point for the other Cage components – Cage Side and Cage Base. 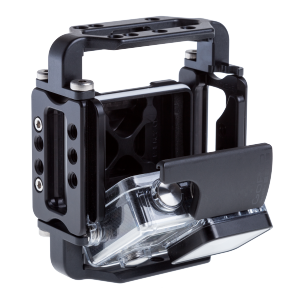 Our Cage Door replaces the HERO3+ door and provides mounting points for the other components. The Cage Door allows for the housing to tilt forward, even with all four Cage Side/Base components in place, so removing the camera does not require tools! 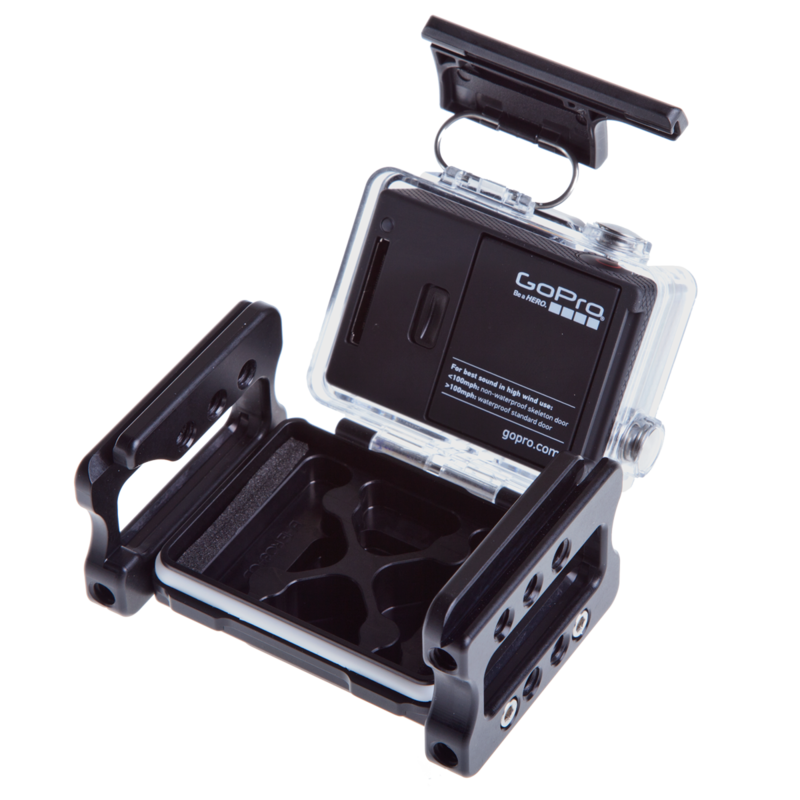 The Cage Door replaces the GoPro housing door and maintains full functionality of the original latch mechanism, even in full cage configuration. This provides users with a very low profile RRS/Arca-Swiss bi-directional dovetail and ¼”-20 mounting sockets while allowing the batteries and memory cards to be swapped quickly, without requiring any tools. Transfer the original GoPro door seal for a waterproof depth rating of 140ft. The remaining plate options attach to the RRS back piece, offering mounting options for RRS standard clamps as well as for our compact X-Jaw Clamp system. 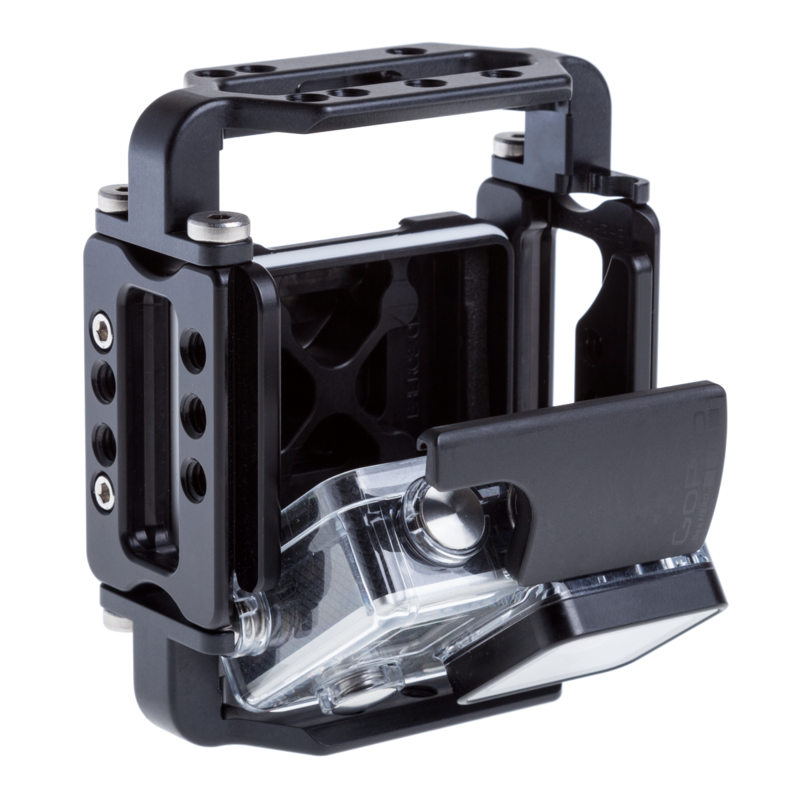 The camera and buttons remain accessible with any combination of the full cage assembly. The Full Cage allows for RRS Dovetail, RRS X-Jaw, and 1/4-20 threaded mounts on all 4 sides – the possibilities are endless! 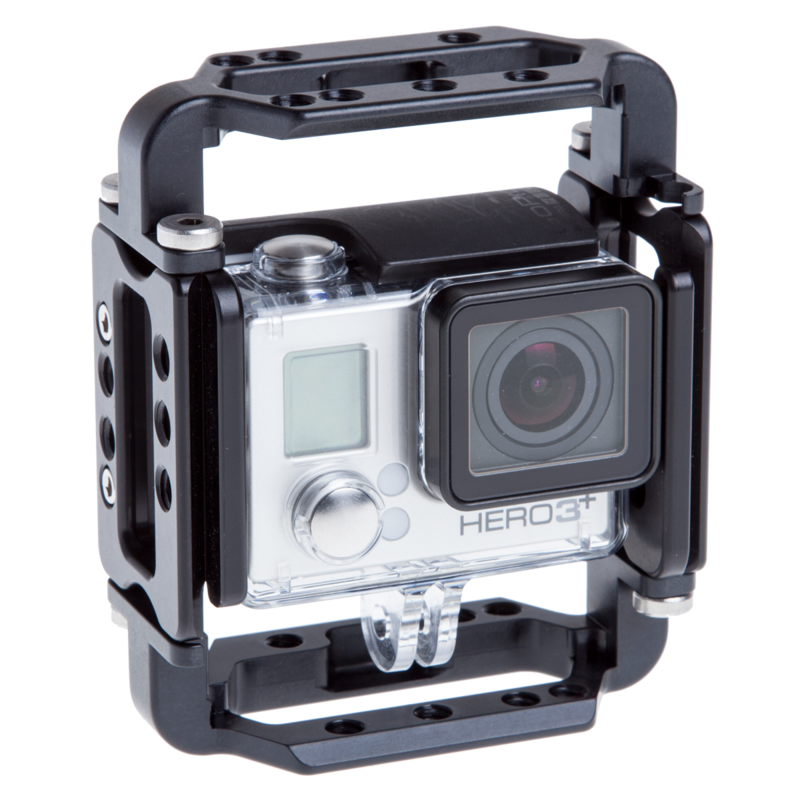 The RRS BHERO3+ Cage parts are compatible with the new HERO3+ Housing that was made to fit the new GoPro HERO3+ – that housing also fits all previous HERO3 camera models. 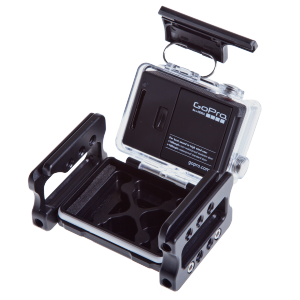 If you have the older cases for the GoPro HERO3 made before October, simply upgrade your GoPro Case to the HERO3+ Housing or the Slim Skeleton Housing and it will work with your existing HERO3 camera and our cage assembly. Pre-orders are open now, and the expected shipping date will be in the third week of November (subject to change). Will it support alignment of lenses for 3D? The dovetails of the cage do allow for lateral adjustment within a clamp, so you could in theory mount two side by side in 2 clamps and adjust the inter-ocular distance that way. We have stereo packages that would be great for that. What was this inspiration for this product? Was there a recurring problem while filming with GoPros that made you guys decided to develop this? I’m sorry, but it’s just not immediately apparent what the big pain this product is solving. Great looking product I will definitely will be ordering a couple of these to my kit. Frames like these are needed to safely mount go pros in race cars. This frame and your safari clamp and a safety cable would be a great and safe way to mount a go pro in a car with a roll bar. I saw a go pro plastic mount break free and end up jammed under the brake pedal of a race car driven by Patrick Dempsey they were lucky and no one was hurt. A well designed frame like yours and a little common cense would have prevented this. Typo: common sense that is…not cense.